“I think this review is a valuable contribution, because it analyzed a number of studies on the lower extremities, whereas most previous work has been focused on the upper extremities,” said Randie Black-Schaffer, MD, medical director of the stroke program at Spaulding Rehabilitation Hospital, affiliated with Massachusetts General Hospital in Boston. Seeing the potential for benefit on walking may encourage people to solve the problems of access to the cortical areas for the lower extremities, she said. •. Li Y, Fan J, Yang J, He C, Li S. Effects of repetitive transcranial magnetic stimulation on walking and balance function after stroke: A systematic review and meta-analysis https://www.brainstimjrnl.com/article/S1935-861X(16)30270-4/fulltext. Am J Phys Med Rehabil 2018; Epub 2018 May 3. •. Dobkin BH, Plummer-D'Amato P, Elashoff R, Lee Jfor the SIRROWS Group. International randomized clinical trial, stroke inpatient rehabilitation with reinforcement of walking speed (SIRROWS), improves outcomes http://journals.sagepub.com/doi/10.1177/1545968309357558. Neurorehabil Neural Repair 2010; 24(3):235–242. 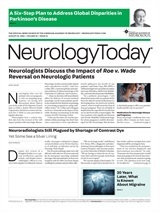 Neurology Today18(13):21-23, July 5, 2018.